Mod: This was originally posted at the bottom of the previous article, but since the first three comments made so much sense I thought I would move it up here and make this into a separate post. It certainly is a topic that has been on the minds of a lot of people over the last year or so. This article, written by Zen Vuong of the Star News, brings up a few points that I think are pretty important. The topics being yellow water, and the extraordinary amount the city has to flush out of the pipes through hydrants to get this water to run clear. Something that many here believe is extremely wasteful. Here are the first few paragraphs. If you want to read the entire article, the link is here. Saving flushed fire hydrant water too expensive, Sierra Madre officials say - The city recently mandated 30 percent water conservation, yet it frequently runs fire hydrant water into the gutter because city workers determined that recycling yellow-orange water that’s provided to most residents would be too expensive. Bruce Inman, director of public works, said Sierra Madre has always flushed out its water system because of health department requirements. But it increased the hydrant flushing frequency in October because adulterated water was coming out of faucets and taps throughout the city. Workers are trying to clear loose rust and particles from pipes by forcing large amounts of water through more often. Sierra Madre owns a water truck that could hold about 3,000 gallons of water, but it is infrequently used during hydrant flushing, Inman said. The city would expend more money saving the water than it would if it let the liquid run its course into gutters and groundwater sources. Even as city employees are running water through hydrants, the council approved mandatory 30 percent water conservation on July 8. While much of the article is a discussion with Bruce Inman, there is also a short interview with Fay Angus about colored water and how that has affected her water usage. How much did the city pay for that tank truck? how often do they use it, get real Bruce, save some water! why can't the same person(s) that go and turn on the hyrdants drive the water truck? Inman has snookered more than one city council. 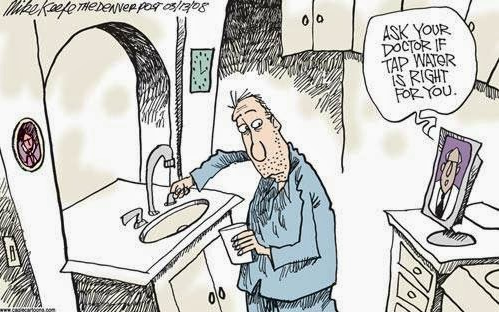 Flush Bruce and most of the problem is easy to solve after that! "Why doesn't the city announce when they are going to flush the pipes so people with gardens can come by and capture the water?" Easy. It would be free and untaxed. Your suggestion may sound far fetched but 2 weeks ago my friends and I were out capturing water as it was flushed from the hydrant across the street with trash cans and buckets. I think it is a good idea. The city should announce when flushing is going to take place. Why not? City Hall would have a problem with it because there is nobody they could charge for their imaginary costs. We pay taxes to cover staff salaries, and then the city charges us back for work we have already paid them to do. It is the most ridiculous thing ever. The only thing more ridiculous is all the city councils that have let them get away with it. 10:33, then you'll love how the city charged the Mt Wilson Trail Race over $ 18,000 for "pre event planning staff time" and apparently that staff time was during regular work time, about 200 hours charged for an event that is the same every year - nothing changes but it took staff 200 hours to pre plan the event. 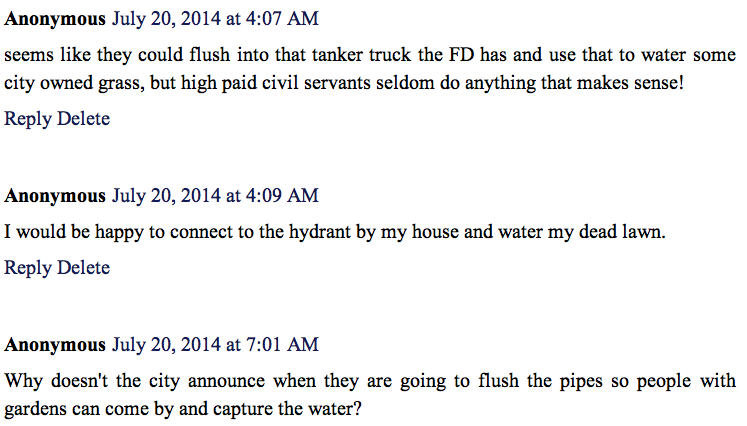 Inman ,the incompetent ,claims the reason the flushing water is wasted is because the City has insufficient labor. If you ever observe a group of City employees working, you'll see why. If there are 6 workers there, I'll guarantee you there are at least 5 sparkling clean, new City pickups there. And the optimistically named 'workers' will be standing around .chatting ! The city can borrow tanker trucks from neighboring cities, they have their own, they can use SMFD tankers.There is a lot that a competent manager could do to at least give a semblance of trying. Inman says flushing accounts for only 0.7% of usage as a justification for such casual wastage. It is still hundreds of thousands of gallons . Bruce doesn't care about us, he is just waiting for retirement, same pay, no pesky citizens, no more of Elaine's micro managment. Does he get to keep the car? Every decision made by City Hall is based on whether or not there is any money in it for them. This water could be recycled and used for tending to the needs of this city's distressed plant life. But where are the taxes? The fees? And would;t this be water given away for free? It is always about them. Capture the water and water the lawn in front of City Hall. I don't understand the claim that there isn't enough staff. Take the employees who do the flushing and have them put one end of the hose in a tanker. So maybe then they add on the time to transport the tanker some useful place, and the routine flushing all together takes some days longer. What's the problem? It is just another way of blaming the residents. We don't pay the city enough for their "services," so Bruce can't hire all the people he needs to prevent thousands of gallons of water being flushed down storm sewers and into the sea. It is your fault. It always is. This after water rates have been raised 100% in 5 years. 10:34, the problem is that you are thinking. eliminates you from working at our city hall. Thinking is not civil in Sierra Madre. maybe one of us geniuses could devise something that draws some water from the flow but still allows a good flush? What if it was directed to the settling basins!? Can't runt the flushed hydrant water into the truck, the large rust flakes can damage the pump, and that's extremely expensive. The reason the hydrants are flushed in the first place is because of the build up of damaging residue. I have always thought that the way to save our downtown is to invite in medical marijuana dealers and have them fill some of the empty storefronts. If Sierra Madre became known as the town where such services are available, it would bring in lots of people. Sierra Madre historically was a town known as a health center. It fits our heritage. Can't. There is an ordinance on the boks from Chief Diaz' reign that says there shall be no marijuana dispensaries in Sierra Madre. 3) Why do the Sierra Madre residents have to suffer and pay a 160% water rate increase? Anybody have a simple answer to my questions? 100%. It is bad enough without embellishing. Do you have a cite for that MWD water for free" claim? Simple answer? Ask Arcadia to pay for the "free" water they stole from Sierra Madre. Unskilled labor still pays well here! !